With a clear understanding that numerous proposed openings would cause a threat to the homes overall thermal efficiency, a thermally broken profile was deemed the best option. The next question asked was how to accommodate a thermally broken frame that would complement the one of a kind style of this home, utilizing the smallest sightline and without compromising their desire to accommodate 1 ¼” dual pane glass. To answer this question, Carl Carfi, Senior Architectural Associate at Mark P. Finlay Architects, enlisted the expertise of Domenick Siano and Bill Polinsky, owners of Steel Windows and Doors USA, in hopes that together they could provide a solution that would meet their efficiency requirements while enhancing the contour and one-off appeal of this home. Realizing the specific needs of the client, Domenick Siano and Bill Polinsky recommended their OS2, Thermally broken Series of steel frames by Brombal were the best option. The dark powder coated finish matched perfectly with the exterior façade and interior décor tastefully. The OS2 series also granted the client the ability to accommodate 1 ¼” dual pane, Low-e, insulated glass with internal grids and ½” lead tape on with soldered joints which greatly increased the homes efficiency. The lead tape and soldered joints provided the final touches to an already remarkable build by capturing the raw feel of historic architecture. 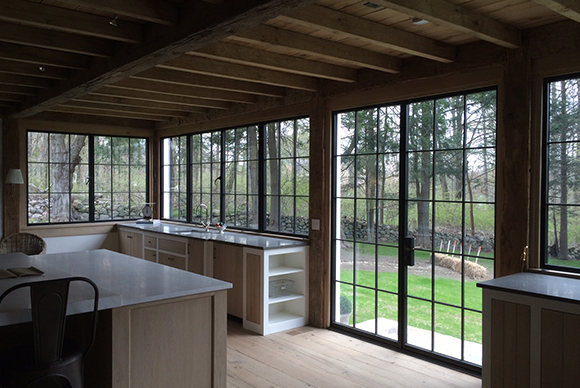 If you are considering renovating your home, trying to increase the thermal efficiency of your space, or searching for a product line that will best accommodate your needs, let Steel Windows and Doors USA help you along the way.